There is a deep paradox methinks in personal knowledge management why? The deeper you delve into PKM the more you appreciate it is the social skills that count. Relationships, connections, exchanges, forums, dialog are the road to impoved personal knowledge - this is clearly not something you can do by yourself! Sense-making, inquiry, exploration, knowledge creation, even learning are mainly social activies. Knowledge flows along trusted relations and new findings need open testing before you can be sure of the value, utility, meaning? and ethics. 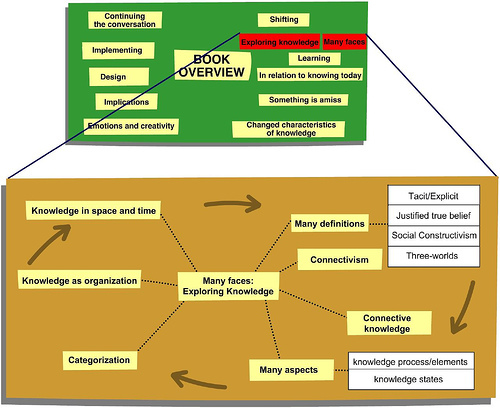 Knowledge IMO does not arise from individual thought organisation, information access or from personal skills, or personal networking but from interaction, context & experience in a very social world. In a nutshell - the most important part of PKM is then networking, dialog, social interaction and sense-making. It is not responsibility for personal learning, not classification and personal access to information, but maintaining relationships, knowing where and who, reciprocity and dialog that gets things done. So what exactly are your thoughts?